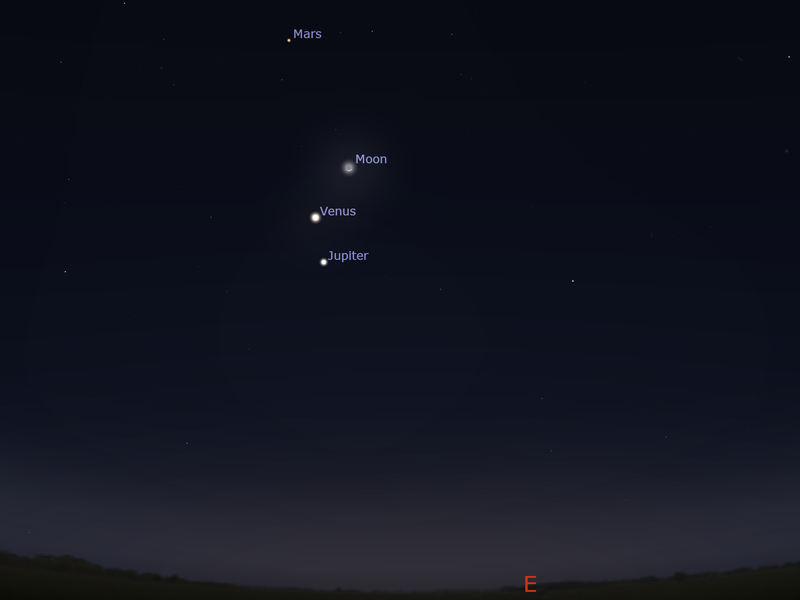 This month the planetary action begins to move to the evening skies, although the the morning skies are still entertaining. Jupiter and Saturn are high in the morning skies with Venus bright below them. Venus and Mercury are visited by the crescent Moon. Lonely Mars is low in the western evening sky. Mercury climbs higher into the morning sky early in the month and is close to Venus by mid-month. Jupiter rises higher in the evening sky and Saturn enters the evening sky at the end of the month. April 1; Moon at Apogee. April 2; crescent Moon near to Venus. April 3; Mercury and the crescent Moon close in the morning. April 9; Mars close to the crescent Moon. April 17; Moon at perigee. April 17, Venus and Mercury at their closest. April 23; waning Moon close to Jupiter. April 25; waning/crescent Moon close to Saturn, occultation in Eastern Australia. April 29; Moon at Apogee again. Autumn has arrived again, and the nights are getting longer. People are dusting off the various spheroids of their preferred football code. Anyone at night time practice can take some time off to stare up at the Autumn skies and see the Milky Way, and the constellations of Carina, Puppis and Vela, blaze across our night sky. Orion the Hunter and his dog Canis major are also magnificent. You don't have to practice a football code to look at the stars, of course. Nights are often cool now, so don't forget a footy jumper before doing any extended star watching. Aurora Alert UPDATED 28/08/18: Despite solar maximum having passed, we are still getting occasional good auroral displays. August 26th 2018 saw an impressive display visible from NZ and Tasmania despite the full Moon. The last week of March 2017 saw some impressive aurora displays from Tasmania, Victoria, SA and WA. September 2016 saw a series of good but transient aurora in Tasmania and southern Victoria. July 2015 saw a massive storm seen as far north as mid NSW, again clouded out for large parts of Australia. 17-19/3/2015, the St. Patrick's Day aurora, massive storm seen as far north as Southern Queensland. Unfortunately clouded out for large parts of Australia. 26/2/2015, yet another good set of aurora were seen from Tasmania. 9/2/2015 There was a series of very good auroral events during February, some were seen in NSW, Victoria, SA and WA as well as Tasmania. Last year saw some nice events and a coronal mass ejection from an M class flare hit us square on on March 17 2013. Aurora were detected as far north as the QLD border, with some really nice events in Tasmania, and here are some images from that event. The Sun is now at solar minimum,and is rather quiet we may see more aurora in the near future. We are now deep in solar minimum, and we can expect to see few aurora. There have been some good displays in Tasmania in the recent past (the St. Patrick's Day storm was a beauty, see as far north as NSW). Tasmania, King Island and Southern Victoria are the most likely places to see aurora. However, on September 24, 2005 there was a massive auroral storm seen as far as northern NSW (and the 22 February 2014 one was seen as far north as southern NSW). Naturally, the best views of any aurora will be away from the city and bright lights. Aurora occur when charged particles from the solar wind enter Earths outer atmosphere and interact with the oxygen and nitrogen atoms producing eerie displays of coloured lights. During solar maximum, which occurs every 11 years, the number and speed of the particles are higher, allowing them to penetrate the Earth's magnetic field at lower latitudes than normal. Observers in Tasmania are likely to see green glows or sheets of light in the southern sky. Observers in Southern Victoria are more likely to see a red glow in the southern sky, although more spectacular displays are possible. 2 January 2019; Venus close to crescent Moon in morning. Mars Curiosity Rover finds stream beds on Mars . Mars Express has a video of 15 years exploring Mars . The Juno mission science mission is halfway complete. April 1; Moon at Apogee. April 2; crescent Moon near to Venus. April 3; Mercury and the crescent Moon close in the morning. April 9; Mars close to the crescent Moon. April 17; Moon at perigee. April 23; waning Moon close to Jupiter. April 25; waning/crescent Moon close to Saturn, occultation in Eastern Australia. April 29; Moon at Apogee again. 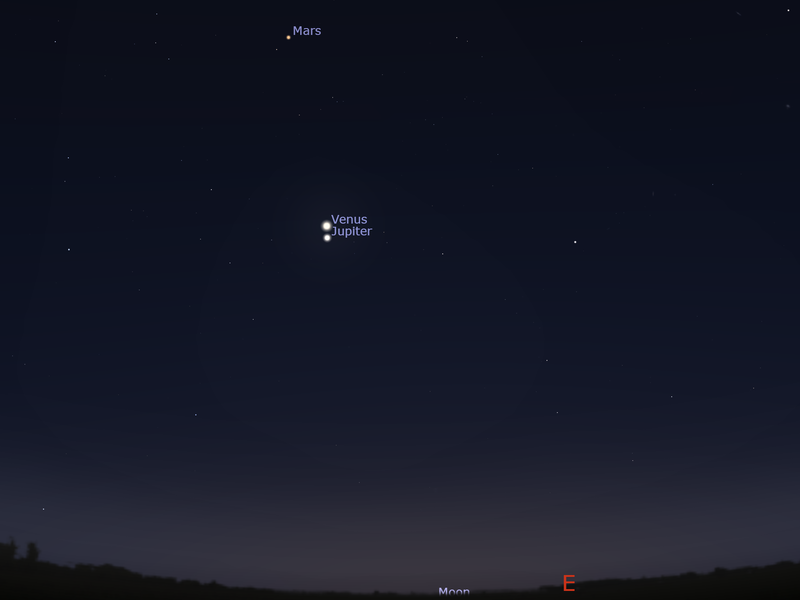 The the morning sky on Sunday April 3 facing east as seen from Adelaide at 5:37 ACDST (60 minutes before sunrise), Mercury and the crescent Moon are close. (The inset shows the telescopic view of Venus, and Saturn at this time, similar views will be seen Australia wide 60 minutes minutes before sunrise). The evening sky facing west on Monday April 9 facing west as seen from Adelaide at 21:05 ACDST 90 minutes after sunset, the crescent Moon is close to Mars. (similar views will be seen Australia wide 90 minutes minutes after sunset). 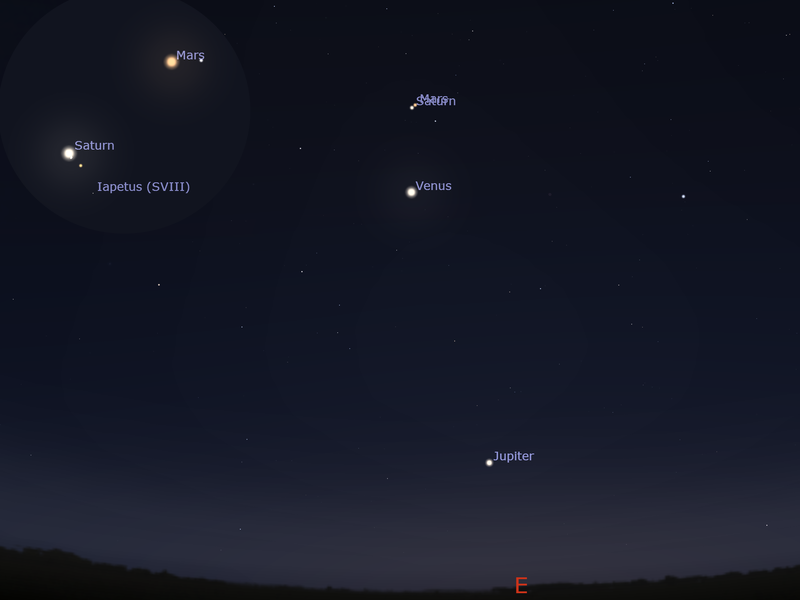 The the evening sky facing east in Adelaide on April 17 at 5:44 ACDST (60 minutes before sunrise), Venus and Mercury are close. (similar views will be seen similar views will be seen Australia wide 60 minutes minutes before sunrise). Mercury climbs higher in the morning sky , this is the best time to see mercury in the morning sky this year. On the 1st Mercury is visible one and a half hand-spans from the eastern horizon an hour before sunrise, two hand-spans below Venus. On the 3rd, Mercury and the crescent Moon are close. By the 15th Mercury is visible two and a half hand-spans from the eastern horizon an hour before sunrise. On the 17th Mercury and Venus are at their closest, just under a hand-span apart. By the 30th Mercury is visible one and a half hand-spans from the eastern horizon an hour before sunrise, a hand-span below Venus. Venus is reasonably high in the the morning sky this month, below Jupiter and Saturn and above Mercury. Venus will lowers towards the horizon as the month progresses. Venus is a distinct gibbous shape all month. On April 1 Venus is two and a half hand-spans above the eastern horizon an hour and a half before sunrise, two hand-spans above Mercury. On April 2, Venus and the thin crescent Moon are close. On April 15, Venus is just over three hand-spans above the eastern horizon an hour before sunrise. On April 17 Venus and Mercury are under a hand-span apart. By April 30, Venus is two and a half hand-spans above the eastern horizon an hour before sunrise, a hand-span above Mercury. Mars is the brightest object low above the western horizon after sunset. Mars spends most of the time in Taurus this month. Mars is close to the beautiful Pleiades cluster at the start of the month. On April 1 Mars is one and a half hand-spans above the western horizon an hour and a half after sunset, close to the Pleiades cluster. On 9 April Mars and the crescent Moon are close. On April 15 Mars is just under one and a half hand-spans above the western horizon at hour and a half after sunset, and is close to the Hyades. On the 30th Mars is just over one hand-span above the western horizon an hour and a half after sunset, close to the Pleiades cluster. Jupiter, climbs higher in the the evening sky this month. Jupiter (still) remains in Ophiuchus this month. April 1, Jupiter is two hand-spans above the eastern horizon at 11 pm local time. On April 15, Jupiter is just over three hand-spans above the eastern horizon at 11 pm local time. On the 23rd the waning Moon is just over a finger-width from Jupiter. By April 30, Jupiter is nearly twelve hand-spans above the eastern horizon at 11 pm local time. In either binoculars or a telescope Jupiter's Moons are always interesting. There are some good telescope moon events this month. Saturn climbs higher in the morning sky this month, and enters the evening sky late in the month. On April 1 Saturn is just nine hand-spans above the eastern horizon an hour and a half before sunrise. On April 15, Saturn is just twelve hand-spans above the north-eastern horizon an hour and a half before sunrise. On April 25 Saturn and the crescent Moon and less than a finger-width apart, and there is an occultation around 11 pm from the eastern states with Saturn low on the eastern horizon. On the 30th Saturn is twelve hand-spans above the northern horizon an hour and a half before sunrise and Saturn is rising in the eastern sky around 10pm. The Iridium satellites have deorbited, However, other satellites do flares as well (bit more rarely) the visibility of Iridium flares is VERY dependent on observer position, so you need a prediction for your spot within about 30 km. Hence I'm referring you to a web site for predictions rather than doing it myself. Heavens above, an excellent site. You need to choose your location or manually enter a longitude and latitude it gives the visibility of the International space station and heaps of other satellites. I find this the most useful site. The figure ZHR is zenithal hourly rate. This is the number of meteors that a single observer would see per hour if the shower's "point of origin", or radiant, were at the zenith and the sky were dark enough for 6.5-magnitude stars to be visible to the naked eye. Illumination gives an idea of how dark the sky is, the lower the figure, the darker the sky. The Lyrids are a northern shower, but can be observed by most mainland Australians. The best time to observe the Lyrids is in the morning between 2.00-5.00 am. However, the Lyrids low rates, combined with their closeness to the horizon, mean that few meteors are likely to be seen. As well, this year the full Moons' light interferes substantially. To see the Lyrids, look to the north in the morning sky. About two hand-spans above the northern horizon is the bright, blue-white star alpha Lyra, the brightest star near the northern horizon. The Lyrid radiant is just above it and to the left by around a hand-span. Outside of the showers, you can still see sporadic meteors. Rates seen from the Southern Hemisphere are around 8 random meteors being seen per hour during the late morning hours and 3 per hour during the evening. The evening rates will be reduced during the times around the full Moon due to interference by the Moons light. There are no unaided eye comets visible at the moment. A list of current comet ephemerides is at the MPC. Occultation of Saturn by the Moon 25 April. The Moon at 22:48 am ACST in Adelaide on Thursday 25 April just as Staurn appears from behind the Moon. 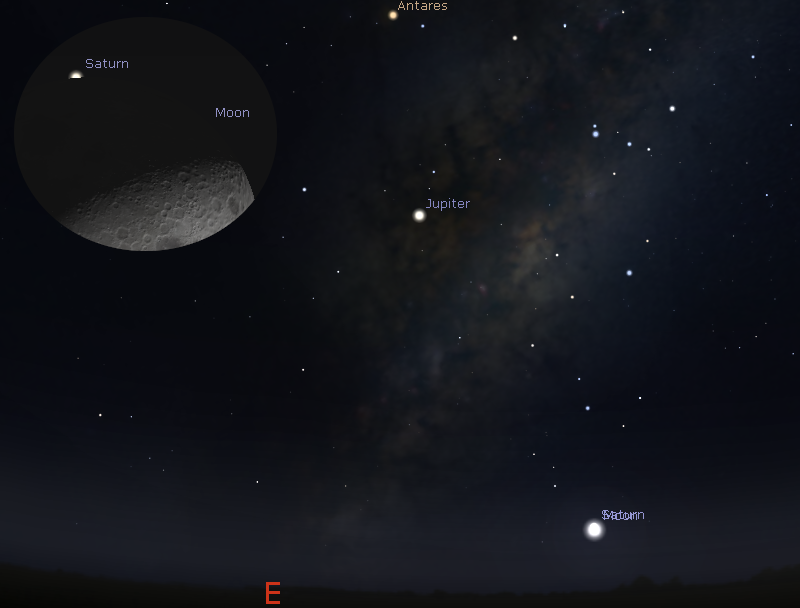 On the evening of Thursday 25 April Saturn is occulted by the waning Moon as seen from eastern Australia. The Moon, although low above the eastern horizon, is a very obvious signpost for where to look but for most locations Saturn is behind the Moon as it rises (or the pair are very close to the horizon just before the occultation starts). Start watching about half an hour beforehand to get set up and familiar with the sky. Saturn will appear from behind the dark limb of the Moon while still low above the horizon, so will be a difficult telescopic target. Reappearance will be hard to see as you have to be looking just at the right moment. While most stars seem to shine with a constant brightness, there are some that undergo regular, dramatic change in brightness. The classic variables are Mira and Algol. Algol is currently not visible and Mira is past maximum and is not readily visible. 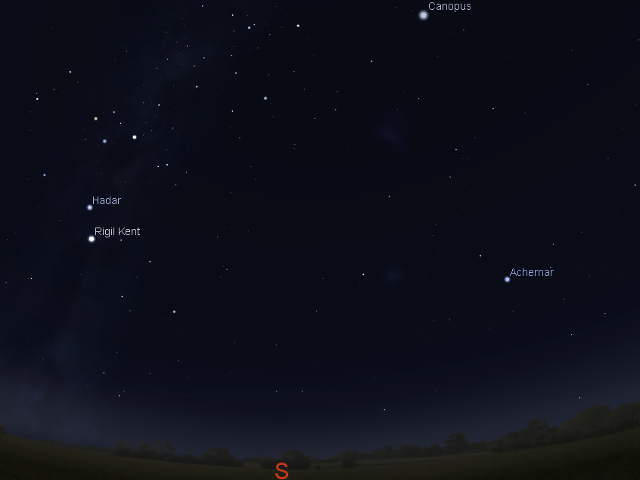 The southern evening sky at 10:00 pm AEST in Melbourne on April 1 (similar views will be seen from other cities at the equivalent local time eg 10:00 pm ACST Adelaide). All descriptions here are based on the view from Melbourne at 10.00 pm AEST (Australian Eastern Standard Time) on 1 April and assumes a fairly level horizon. Starset occurs progressively earlier each day, so these descriptions are valid for 9.00 pm on the 15th and 8.00pm on the 30th. Readers from other time zones should see roughly the same views at 10.00 pm local time. Corrections for cities other than Melbourne are given below. At the beginning of April, the Milky Way is a spectacular sight as it arches across the sky. Just 4 hand-spans above the eastern horizon is the triangle of faint stars that make up Libra, the balance. To the right and closer to the horizon is the distinctive hook shape of Scorpio, the scorpion, which will become prominent in the later months. To the left of Libra and around two hand-spans up and three hand-spans left is bright white Spica, the brightest start in the constellation of Virgo. Spica marks to top right-hand corner of a rectangular group of stars that marks out the body of Virgo, the virgin. Directly above Virgo by about four hand-spans are the long rambling constellation Hydra, and crater the cup with its distinct,but upside down, cup shape. Three hand-spans above Spica is the kite shape of Corvus the crow. Five hand-spans to left of Virgo, is Leo, with the sickle of Leo, an upside down question mark with bright Regulus (alpha Leonis) at the end of the "handle", being quite clear. Cancer, which contains the attractive "Beehive" cluster, is 5 hand-spans to the left of the sickle of Leo. The rectangle of Gemini is 6 hand-spans to the left of Regulus and 4 hand-spans down (just two hand-spans above the horizon). The bright stars of Gemini, Castor and Pollux form an attractive pair less than a hand-span apart. To the left again of Gemini, and just above the western Horizon by two hand-spans is the distinctive saucepan shape of Orions belt. The handle of the saucepan is Orions sword, which contains some good naked eye open clusters, and the final star in the handle hosts the famous Orion nebula, which is visible to the naked eye under clear skies. Directly above the handle of the saucepan is bright Rigel (beta Orionis). Directly below the saucepan is the bright reddish Betelgeuse (alpha Orinonis), a red giant star. 4 hand-spans up from the belt of Orion is Canis major. The bright white star is Sirius (alpha Canis Majoris), the brightest star in the sky. 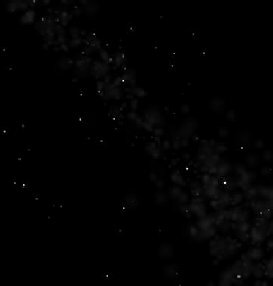 The constellation of Canis Majoris has a number of open clusters that are well worth exploring with binoculars, Most of these lie two hand-spans to the right of Sirius, amongst the V shaped group of stars that marks the tail of Canis Major. Below Sirius by two hand spans, and one hand-span to the right is M47. This cluster is quite nice in binoculars. Just above Canis Major is a battered group of stars that forms Puppis, the poop deck of the former constellation Argo Navis. At the very Zenith is Vela, the sail of that same ship. When, Argo Navis was broken up into Puppis, Vela and Carina (the keel) in 1750, they forgot to assign alpha and beta stars to Vela, and its brightest star is at magnitude 1.5 is Gamma Velorum. Gama Velorum is a double star which may be resolved in good binoculars. The Milky Way passes through Vela, and there are many open clusters which can be seen with binoculars or the naked eye. One of the best of these is NGC2547, a little below gamma Velorum. Vela is also home to the spectacular Gum nebula (which can only be seen in telescopic photographs), and the second pulsar to be observed optically. Kappa and delta velorum, with iota and epsilon Carina, make the "false cross". A high definition map of Vela is here. Just below Vela, to the south, is Carina (the keel). A high definition map of this region is here. Looking almost anywhere in the area stretching between Canis major and the Southern Cross will reveal an interesting cluster or star formation. However, the area two hand-spans up from the Southern Cross and two hand-spans to the left is particularly rich. Here you will find the "Southern Peliades" surrounding the tail star (Theta Carina) of a prominent kite shaped group of stars in Carina. Smaller and less spectacular than their northern counterparts, they still look very nice in binoculars. Four finger-widths to the left of the Southern Peliades are two rich open clusters, and the barely visible star Eta Carina. Eta Carina's spectacular nebula is only dimly seen in binoculars. Two hand-spans below the zenith to the south is the False Cross, just below the False Cross is a good open cluster, just visible to the naked eye, and very nice in binoculars. One hand-span to the left of the False Cross is another rich open cluster, again, very nice in binoculars. Canopus (alpha Carina) is a bright yellowish star 9 hand-spans from the south-western horizon. Facing due South, five hand-spans to the left and ten hand-spans up are Alpha and beta Centauri the so called "pointers", with Alpha being the yellow star which is closest to the horizon, and Beta the blue white star a hand-span above and a little to the right. Slightly to the right again, and following a line through the "pointers" brings you to the Southern Cross, twelve hand-spans above the horizon at about the 11 o'clock position on a clock. A high definition map of Centaurus and Crux is here. Just below the Southern Cross is the coal sack. This dark area against the glow of the milky way represents a large dust cloud and is clearly visible in dark skies. The Jewel box in the Cross is a small open cluster just below Beta Crucis, the southernmost bright star in the Cross at the moment. It is quite beautiful, but requires strong binoculars or a small telescope to see properly. Returning to Alpha Centauri, a hand-span from this star to the left and a hand-span up is a small star, half a hand span up (and about a hand-span to the left) is a fuzzy star, this is omega Centauri (5139 on the map), a globular cluster of stars which is quite spectacular in good binoculars, and more spectacular than 47 Tucana (see below). Another hand-span to the left and about two fingers down is Centaurus A, a very radio bright galaxy (5128 on the map). You need a dark night and binoculars (at least 10 x 30) to see it, but it is one of the few galaxies you can see in the southern hemisphere (outside of the small and large Magellanic clouds) without a telescope. Four hand-spans straight up from south, and half a hand-span to the right of due south, is the extended nebulosity of the Small Magellanic cloud, one of the dwarf satellite galaxies to the Milky Way. This feature is best viewed on a dark night, away from the city. In this nebulosity is what looks to be a fuzzy star, this is 47 Tucana, a spectacular globular cluster that is very nice through binoculars. Up ten hand spans from due south and five hand-spans to the right is the Large Magellanic cloud, the largest of the dwarf satellite galaxies. Binoculars will reveal a rather attractive nebula near it, the Tarantula nebula. 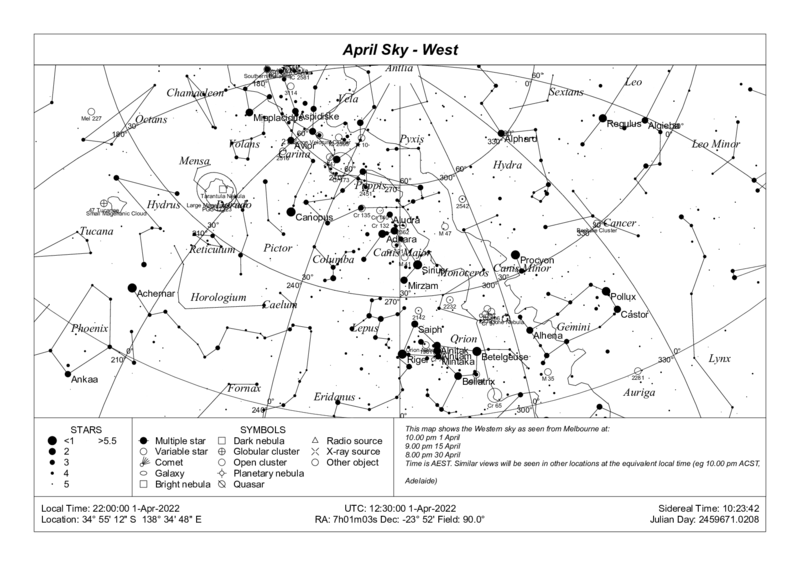 A view of the Eastern April sky at 10.00pm AEST on 1 April can be downloaded here (aprsky_e.png 30 Kb) and a view of the western April sky can be downloaded here (aprsky_w.png 30 Kb). These are more compact files but don't have a lot of resolution. I use a combination of a 1962 star chart, the Australian Astronomy 2019 almanac and SkyMap Pro 11.0 . I highly recommend the Australian Astronomy 2019 almanac. It is more helpful for planetary/comet/asteroidal observations and eclipses than for double stars, clusters galaxies etc, but is an excellent resource for Australian observers and anyone who would like to seriously follow the planets in Australia should have this almanac. It has easy to follow month-by-month summary information, as well as detailed charts, tables and whole sky maps. It is easily navigated. The Almanac is often in big bookstores or optical shops, or email info@quasarastronomy.com.au to purchase a copy directly for those outside major population centres. The Australian Astronomy almanac comes out in around November for the following year, and is now approx $30. This is not meant to be a product endorsement of any kind (outside of the Australian Astronomy 2019 almanac. For any budding astronomers out there, it is fantastic value and no, I don't have any commercial interest in it, but I did win bronze in their website Olympics). This page is provided by Ian Musgrave and is © copyright 2019 Ian Musgrave, except the "Southern Sky Watch" logo, as well as any other ABC logo used on this page, is © copyright of the ABC. 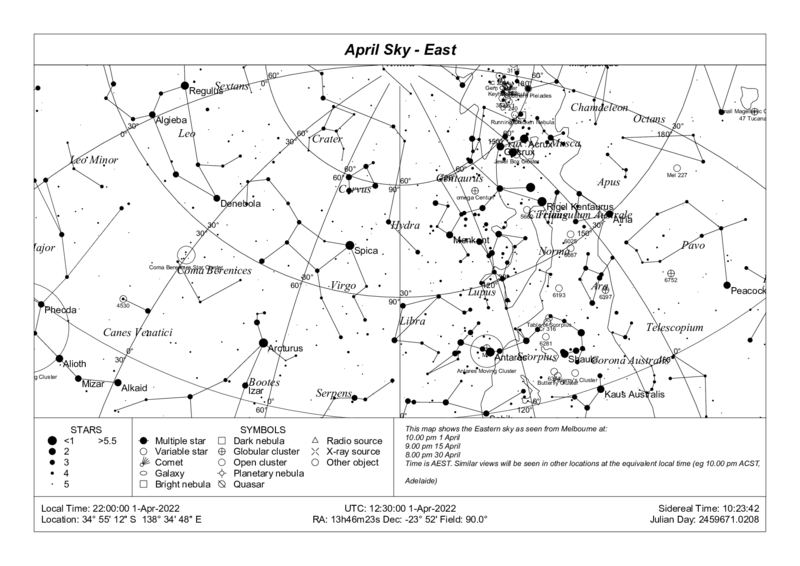 Sky maps are generated with SkyMap Pro 11.0 .